I never quite realized that green fireballs were seen in NM all the way back in 1949. About 10 years ago I saw what at first I thought was a green fireball, but on closer inspection happened to be a powerful green laser shooting into the sky from Sandia/Kirtland AFB. It was supposedly used for some astronomy purpose was the rumor I heard after inquiring with a few people I thought might know the purpose. After that I assumed that probably all green fireball stories were really just lasers and people unfamiliar with lasers were mistaking them for something mysterious. However, there are several articles at the site where I got the one below that are also early reports. The laser wasn't invented until 1960 and I believe it was only the ruby laser which was red, it was several years after before there was a green laser so maybe that can't account for all green fireballs sightings. There is also another explanation, all the cited sighting of green fireballs prior to 1960 took place near a national lab, or research lab. The one below in Los Alamos, one in Albuquerque where Sandia National Lab is located and a some in Alamogordo, which is next to Holloman AFB and White Sands Missile Range. Is it possible that lasers were really invented long before the public was made aware of them? Really they were invented years before Theodore Maiman patented his ruby laser, but for some reason this was top secret and so Maiman was just allowed to patent it and take credit for inventing the laser? Shades of the flying saucers! Los Alamos now has flying green lights. These will 'o wisps seen generally about 2 a. m., have alerted the local constabulary and their presence is being talked about in Santa Fe bars. But local wheels deny any official knowledge of the sky phenomena. Each one passes the buck to another. A call to El Paso, Tex., brought official denial from D. K. Brown, head of the Federal Bureau of Investigation district that embraces Los Alamos, that his agency had not been called to deal with the matter. At the information or thought-control office officials indicated that they knew about the recurring green flame in the sky but indicated that it wouldn't be wise to write about it. Capt. Carroll Tyler, project manager, said simply that all he knew about the lights was rumor -- the same rumors that everyone is hearing. At the thought-control office the general reaction was that the matter was out of AEC jurisdiction and the best way to find out what was going on was to call Kirtland Field. A call to Kirtland showed that an Army captain who asked that his name not be used because he didn't know anything, didn't know anything. He was eager to learn, though. Official reaction was the same on the Hill except for the atmosphere of secrecy that has been thrown about a matter discussed in every saloon and drawing room from here to Santa Fe. There was even no speculation. Could these be visitors from Mars or from the Russias [sic]? No answer. But enough competent observers had told this observer that there was indeed something in the wine. And something much more tangible than the time last summer when one of the local security officers ordered out tanks and jet planes from Kirtland Field to shoot down a light low on the horizon that happened to be Venus, a well-known planet. The jet pilots, trigger fingers ready, were disgusted at that alarm. Maybe that's why they're now querying the green lights. Have you seen a green light lately? Nice blog Lesley! Looks great. About the green fireballs; it's interesting. Washington State has had its share of green fireballs too; a couple of years ago there was a sort of green fireball flap. I've seen the "green flash" near Alamo. Probably something at the base. I wish I would see green fireballs again. Even though I knew what it was that laser was pretty damn awesome to see. I have seen those green fireballs too herre in South Carolina. The first one I saw was during my kid's soccer game. I felt the need to look up aand there it was. I yelled for all to look up. The game stopped while this thing went across the sky about 300 feet up and very very slow. Took almost 3 minutes to get across. We live next to an airport, so we can definitely say it was not a plane on fire. I have seen three more since then and my son has seen two others. I thought it may have been a meteor but the thing is, that meteors are mostly iron, so burning in the atmosphere should be reddish yellow. The only metal I can think of right now that burns green is copper and copper alloys. Everyone of these that we have seen, travels from north to south, as far as I can recall in our part of the sky satellites are seen going in the opposite direction (I keep track of the ISS and the Shuttle). So the question remains, what are they? And why are they green? I wonder if the green fireballs are in anyway related to the blue *apples* spotted at megalithic sites in Ireland, etc. It would be cool if someone had some insight into that. I have seen these almost neon green fireballs twice in the area of Bascom, Ohio. My daughter saw the last one with me. The ones I saw appeared to be dropping very slowly from the sky with a long tail of green at the bottom...Incidently the area is also where I saw two UFO's coming straight down for the ground and then fading out and disappearing. 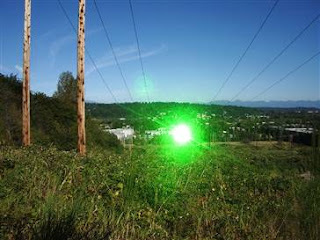 I saw a green fireball last night 3-20-2008. It was steaking twards the west and had a tail. I was curious about green fireballs and found this blog. Oh, I live very close to Sandia Labs. Bongo -- Damn, I missed that! I haven't seen the green laser fired up in a long time, but when they move the beam quickly across the sky it can look like it has a tail. It is interesting that one of these were seen in South Carolina because I was traveling through South Carolina this weekened and saw it for myself. I was also near an airport and couldn't believe my eyes.It was a huge green fireball that was moving as if it was falling out of the sky, and then it disappeared. I googled Green Fireballs today to try to make some since out of my experience. ABQ Approach Control: "XXXX, Turn left, heading two-eight-zero, descend and maintain one-two-thousand, report ABQ airport in sight". Flight XXXX: "Uh...ABQ Approach, that heading puts us straight into a large green laser." ABQ approach control: "Oh, are they doing that again tonight? Left deviation approved"
I've always wondered if anyone else ever saw this thing. Whatever it was, it appeared to be a very bright, thick, green laser beam of light that looked like it went all the way to space. It only appeared for a few seconds at a time, and looked like they were "shooting" something in space - was pretty cool to see. I was glad we vectored clear of it. I didn't see any green fireballs - my guess is that most of you are seeing St. Elmos Fire.